Listen, Mr. Price was not only a gifted actor but he was delightful person and amazing chef. I have a lot of cookbooks I’ve inherited in the house, some of them were published by women’s clubs; Motion Picture Mothers, Beverly Hills Woman’s – and while they’re fun to read most of the food is of the novelty variety, i.e., somewhat unappetizing to modern tastes. But, a cookbook I cherish is, “A Treasury of Great Recipes” by Mary and Vincent Price. 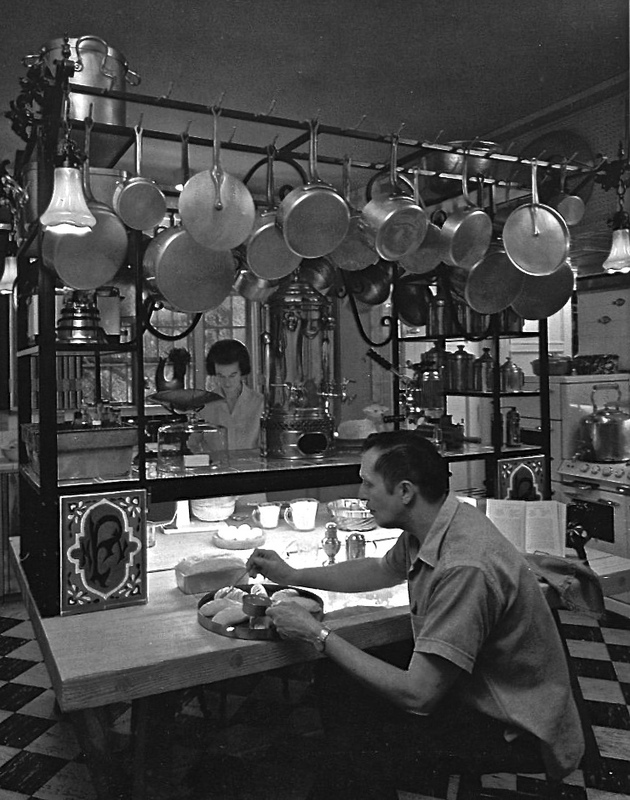 It’s full of personal anecdotes and recipes collected during visits to the great restaurants of the world (in the 1960s). If you can find it, get yourself a copy, and toast the memory of a wondrous couple (well, for a nice stretch: 1949-1974), Mary and Vincent Price. Are you fascinated by the range in the corner? I wish I still had the one I grew up with – it’s a Town & Country range by O’Keefe and Merritt – the real deal my darlings. A behemoth of the best sort, and you can do a sit down dinner for twelve even if the power goes out. 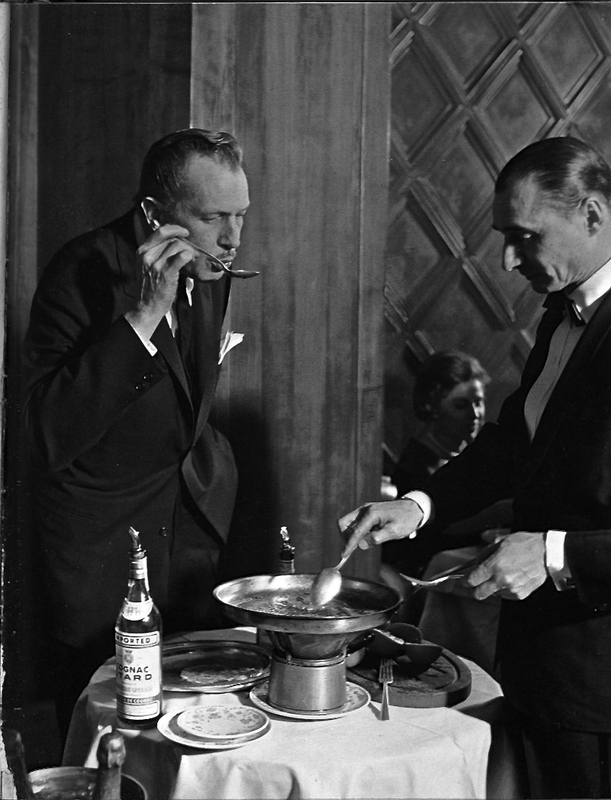 Here’s Mr. Price tasting as Tony at the Whitehall Club in Chicago prepares crepes suzette. One of my favorite actors of all-time. You know it surprises me not one jot that Mr Price should have been handy in the kitchen. Something about that man has always exuded a cultivated existence to The Dandy. Perhaps it is a slight Britishness in his manner, but I never really managed to find him creepy in the way one was supposed to, not even in those wonderful Corman flicks he featured in. He was a man of cultivation and GREAT good humor who started his career, I think, after attending school in the States – in the British theater. He studied at the Courtauld Institute, part of my alma mater and then segued onto the West End. The Courtald was and is part of the much larger Universoty of London, but we were lucky enough to be allowed to attend courses there, the only thing apart from Old Norse, Mediaeval French and Classical Italian I was allowed to try outside my core curriculum. May I be so bold as to inquire what that core curriculum was? No, wait. That’s very inquisitive. I’ll just refer to you as the Renaissance Dandy! Oh, he is SO dreamy! He had an art collection, he cooked, he played insane widowers…..I almost got that cookbook and it was signed! It got sold though. I love Vincent Price!